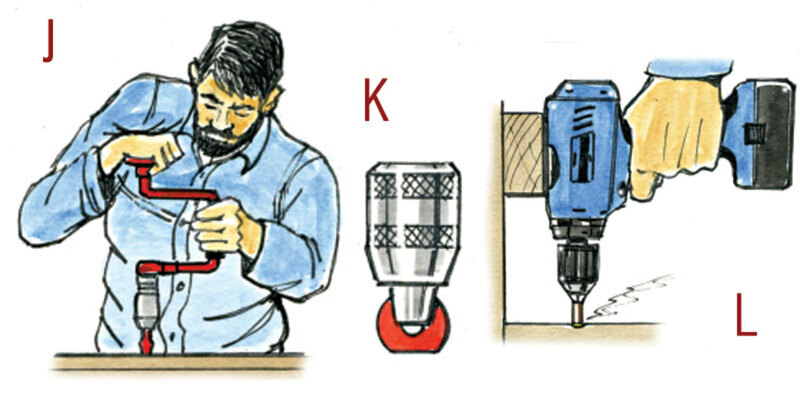 F. Use the biggest screwdriver that fits the screw’s head and tap it in with a hammer. This helps it fit better and may dislodge anything gripping the screw. If it won’t budge, try doing it up half a turn. G. An impact driver imparts a massive turning force when you strike it hard with a hammer. Make sure the surrounding structure can withstand a hefty wallop. 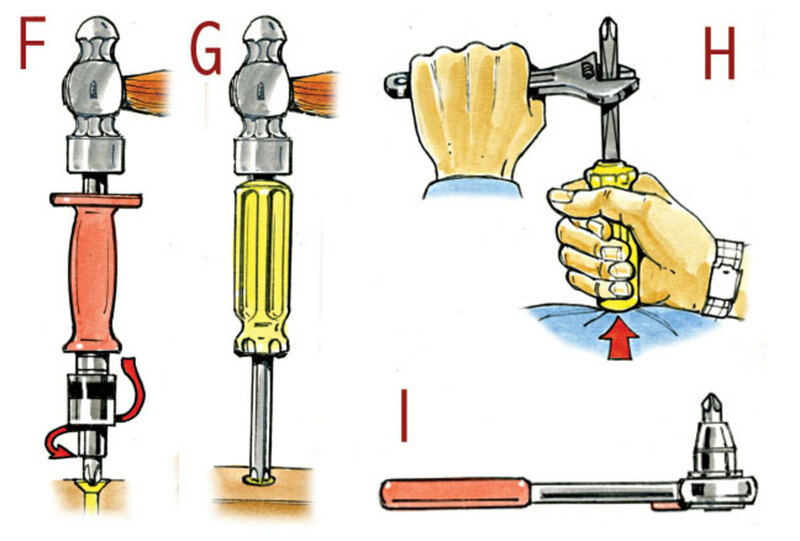 H. You can increase turning force by putting a wrench or a pair of pliers on a screwdriver with a square shaft. I. A screwdriver bit set in a socket-wrench also increases torque. J. A brace with a screwdriver bit is a powerful tool. It’s easy to push down on it and turn the bit at the same time. K. If you cut a washer square at one end, you can create a big screwdriver bit. L. Heat sometimes helps to break a screw loose. If you don’t have a heat source, a wooden dowel running counter-clockwise in a drill will generate heat through friction. You’ll need to support the drill or it will skid off the screw head. M. A metal rod heated with a gas torch works better. N. If the screw is stripped and just spins when you turn it, put the tip of an old chisel under the edge of the head to ease it up. O. If it all goes wrong, try to get a hacksaw blade behind it to cut the screw. One friend of mine, when replacing several planks, made up a big dolly like this to stop the wood splitting as he drove out the screw heads. Note the hole in the other end to knock out the heads. 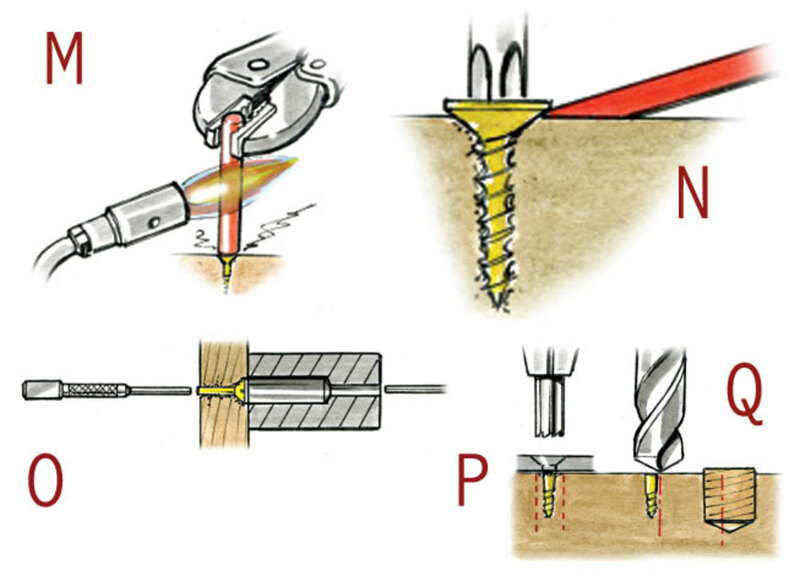 P. If a screw head twists off and you need to replace it, you can file teeth on a metal tube and drill out around the screw. Q. Another trick is to use a 10mm drill bit to take out both the screw and the wood around it. Fill the hole with a standard plug and drill a new pilot hole for a new screw.